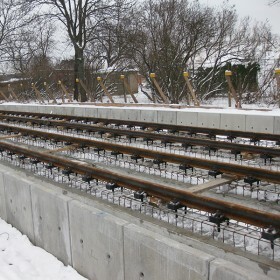 The fastening system W-Tram has been developed as a single support point with screw-dowel combination for urban transport, especially for tram projects. Thanks to the high proportion of long- lasting plastics, the system W-Tram ensures corrosion protection and electrical insulation. In more than 40 years, the system W-Tram has proven to be successful on rail tracks of a length of approx. 600 km all over the world.